With plenty of renewed interest in the personal VPN niche due mainly to the increased need for privacy and protection against malicious internet attacks, it is well worth the time to look at this StrongVPN review. For starters, it’s important to evaluate all available options prior to choosing a provider. After all, if it’s personal security and safety that you are talking about, no effort should be spared in going for the bet service possible. In this StrongVPN review, we will look at the offered features of the StrongVPN brand. We will also look at the marketing and customer service strengths and weaknesses of StrongVPN and perhaps leverage other StrongVPN reviews prior to coming up with a recommendation. The end goal is to show the client the available options offered by this brand versus the competition. At the very least, one should be able to talk about what can be expected should one sign up for a StrongVPN offer. One of the most established personal VPN companies in the world having done business since 1995. StrongVPN’s reputation especially among American users is well documented. Three of the most common connectivity options are supported including PPTP, L2TP/IPSec and OpenVPN. SSTP and SSL protocols are not used on the StrongVPN network. 250 server locations in 70 countries worldwide. The most notable server locations are in North America and Europe but there is little support in other areas most notably in Africa and the Middle East. Support for multiple devices is available. Apple and Android devices including DD-WRT wireless routers are covered. Various operating systems such as Mac, Linux, and Windows are also fully compatible with the StrongVPN infrastructure. Multiple pricing schemes available which is drawing mixed responses from other StrongVPN reviews. Other users find it taxing to have to identify your specific needs in order to select a compatible plan. Many other StrongVPN review finds this a boon since you can tailor your needs specifically to the offer so you do not have to overspend on services you do not need. Unlimited bandwidth is a boon for any user, just ask all other StrongVPN reviews. Multiple options available to get in touch with customer service personnel. Skype, Email and Help Desk systems are in place in case there are issues related to service quality. 7-day money-back guarantee puts clients at ease and allows for an opt-out should they not like the service. Of course, this StrongVPN review would not be complete without analyzing the details of the service and how it can benefit or put clients at a disadvantage especially when viewed in the prism of other competing services. One of the most essential features of a personal VPN service is its ability to reach a wide area to allow clients to do what they want without being limited by the service’s reach. In this regard, StrongVPN has a solid reputation in North America and Europe where it has been doing business for a long time. Still, it has to be mentioned that StrongVPN does not enjoy the same reach as competing brands on the market. Some personal VPN companies have 50% more server locations worldwide and that leaves something to be desired for the global traveler. Oftentimes, a VPN service will dazzle you with so many tech language to fool you into thinking that they offer the best package available. This can be true of VPN protocols that offer SSTP and SSL protocols which are useful but ultimately not necessary. StrongVPN recovers in this regard by offering the bare essentials: OpenVPN, L2TP/IPSec and PPTP. All-in-all, no complaints from this StrongVPN review. We’ve already mentioned how this can be a mixed bag for other StrongVPN reviews. Some like the complexity of having to tailor your VPN plan to your needs while others find it troublesome that you have to think before you choose. So which one is it? Just PPTP or do need all three? Do you get the 4-city special or the standard open? Well, at the very least, all StrongVPN plans offer unlimited bandwidth and that ease your confusion a bit. In terms of pure pricing strategy, however, some brands do it better than StrongVPN. There are plenty of other concerns raised by several users in many StrongVPN reviews. Installation procedures are complicated, to say the least and issues over privacy problems especially when the connection is terminated and you are switched back to your ISP. StrongVPN also only offers 128-bit encryption, one of the more antiquated systems considering there are 256-bit systems available. Overall, there are plenty of concerns that should raise red flags for serious clients. Let’s not sugarcoat it: there are better brands than StrongVPN that offer more competitive pricing with better services that are easier to understand and more reliable. And this StrongVPN review is not alone in that regard; plenty of other StrongVPN reviews will echo the same sentiment. 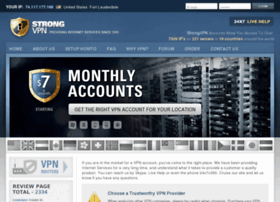 So if you are looking for the best VPN service out there, StrongVPN is not the brand for you. However, if you really understand the features and demands and you think it works for you, then you can bet that it’s more than a serviceable product to meet your basic VPN needs at the least. I decide to give a try to strongvpn , even if the price is high, i thought i will get a good service and that is what i need.. I applied to lite package 60 USD/6 months, i sent to them 80 USD as i did trought wire transfer i and i was afraid also their bank take also some comission, but ok no .. they received the 80 USD..
First week speed very good.. then after start to slow down.. really so slow that i cant even surf.. even using a free vpn was 10time faster.. they told me try other servers.. i tried one.. ok.. fast speed so after 1 week of full speed and 1 and a half month of almost no service, ( iwas traveling so no even chance to take time to deal with this , i thought was mmy computer or my connection), y changed to other server .. they told me that service its more expensive..
ok.. i already have 20 usd as credit so.. upgrade..
after 20 days they billed me 15 more USD.. and in 1 month service expire! so.. 2 months almost no connection, 1 month of ok speed.. and then they want 95 USD for that months!. i told them ok.. wait.. i iwll go back to the old service .. i prefer even not have speed or conenction that pay 15 usd more so.. downgrade please.. ans i still will have 3 more months.. They just cancell my acounnt and took al my money!!!.. means 3 months.. only could use 1 month.. at 80 USD!.. This is what you get for dealing a bunch of russians!, i regret not listening the advices.. now i have another vpn .. 50 USD year.. and speed is even 1- times faster than the strongvpn premium one!..